No-till soil prep is a way of growing crops from year to year without disturbing the soil through tillage – meaning you improve soil health over time rather than consistently degrading it. 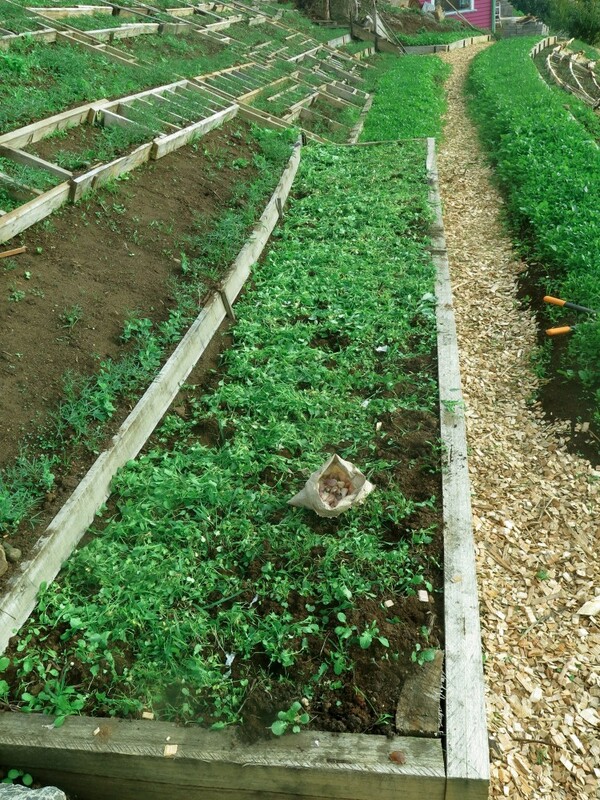 It’s a method quite common in the market gardening community and something we’re starting to use at our own place now that we have nice, long straight’ish beds. On the new patch of land we recently bought we did some significant earthworks in Autumn and have been growing green manures ever since. 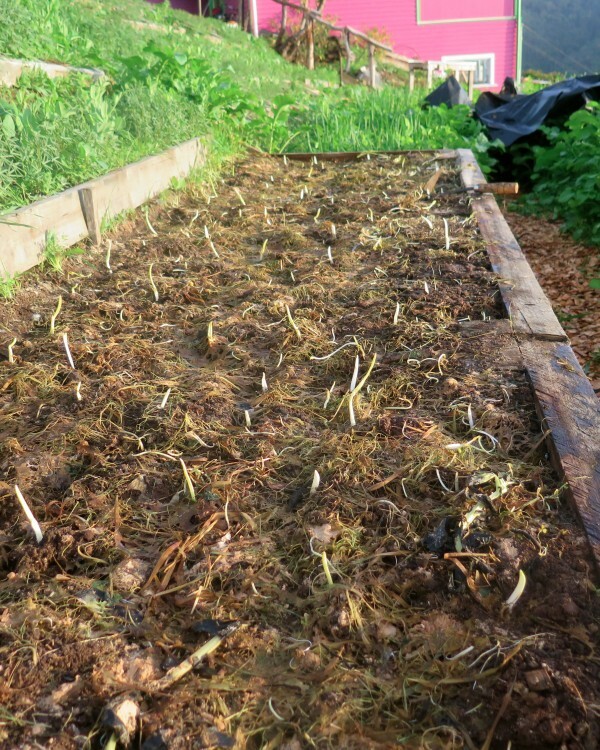 We’re letting 98% of the green manure crops grow until late winter, but we did put in a small garlic patch and used the no-till method to help us do it. 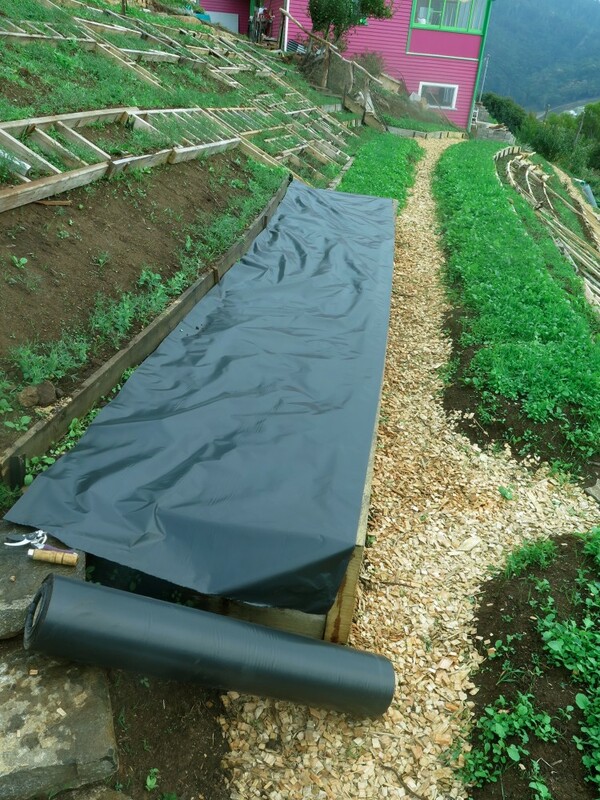 This method uses silage tarps as a form of weed/crop control, meaning instead of digging in your green manures (or crops) you temporarily cover the bed in non-toxic, UV stabilised plastic to do the job for you. I know – it sounds whack and it actually took me a while to get my head around it. 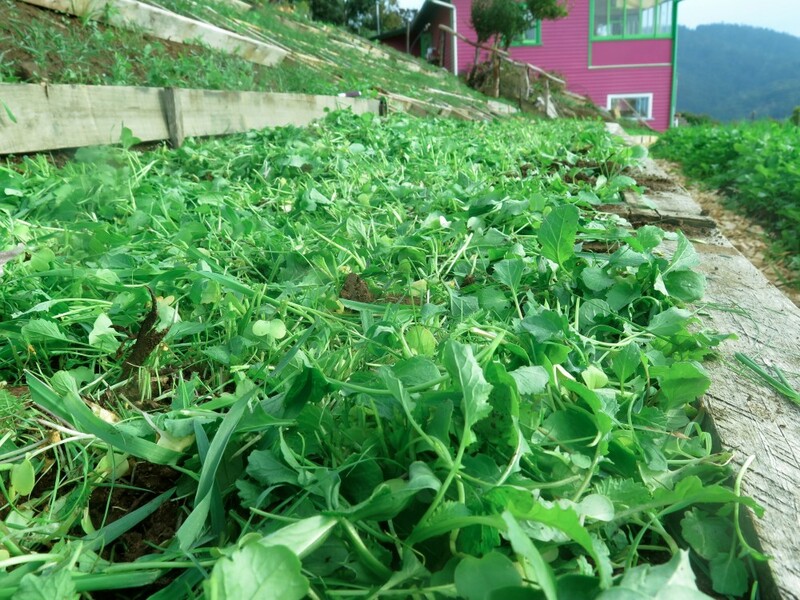 But after seeing it in action at the Hobart City Farm, and seeing how darn well it worked I was sold. 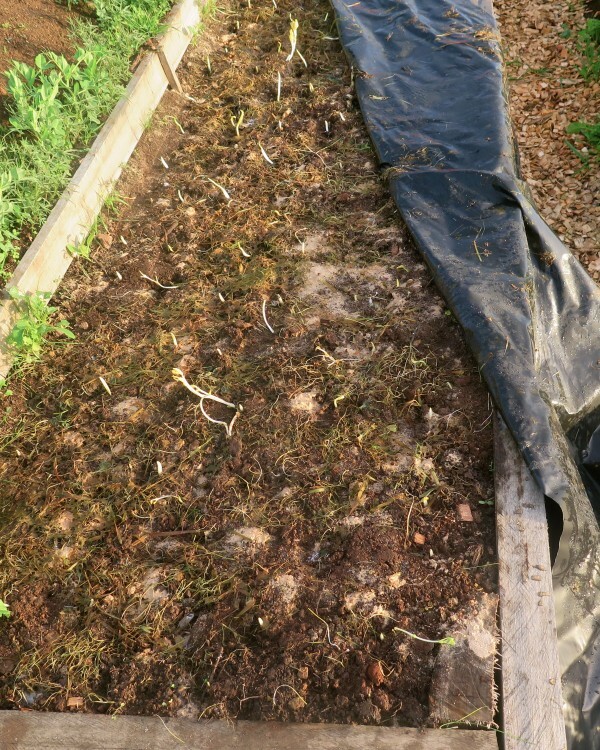 Firstly we cut the green manure crops down to the ground, as they were already pretty short we left all the green waste on the bed. If your crops are really tall you’ll want to remove some of them as too much fresh, green matter can create an anaerobic environment which isn’t great for soil life and health. 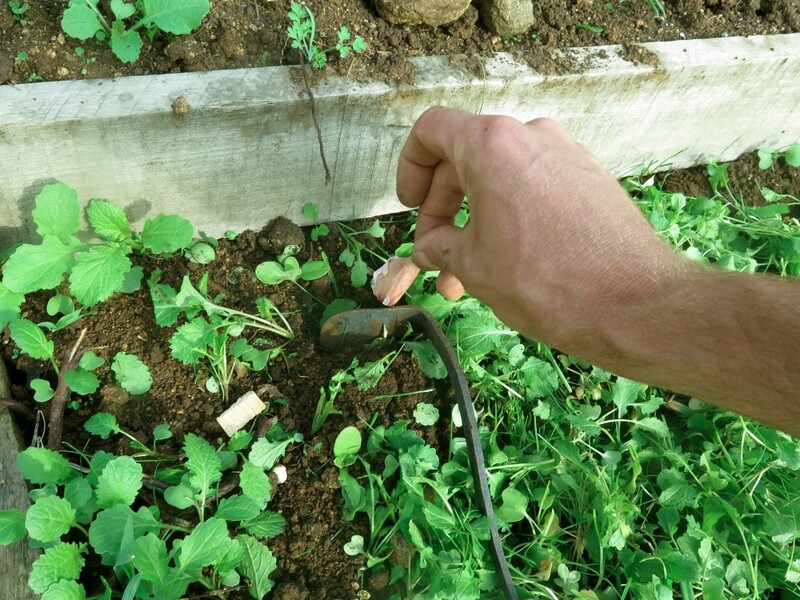 Then we planted directly into the bed with no digging except to make a small hole for each garlic. We also sprinkled a small amount of gypsum as our soil needs this. This is where you might want to spread a layer of compost, it just depends on your soils and crops. Once fully planted, water in the crop (if needed) and cover with your silage tarp. We actually used non-toxic black builders plastic as this is what we had available. 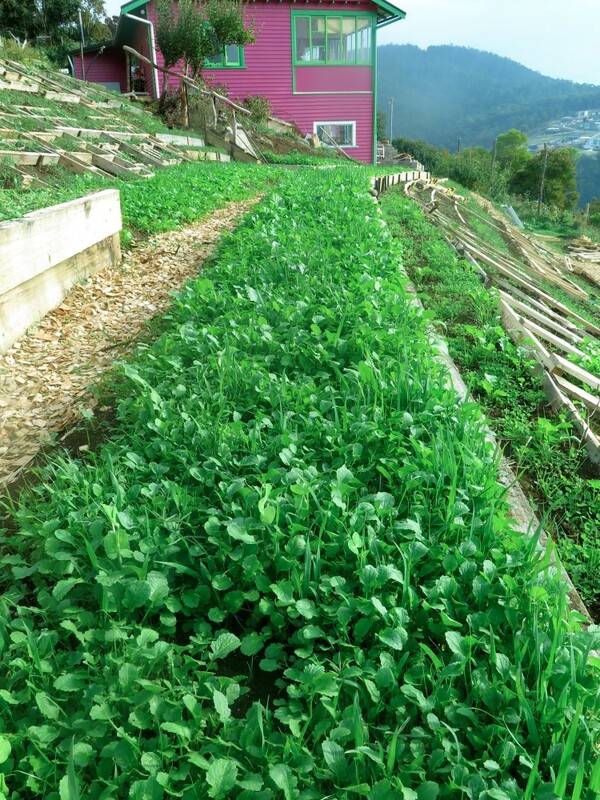 While we’re a bit unclear whether this is acceptable for organically certified farms we do know some market gardeners who use it in this way who grow chemically-free and grow well! We’re comfortable using it as our research tells us this particular type is non-toxic and UV stabilised. What’s the plastic actually doing? Drawing up soil life (earthworms galore) to the top layers of the soil where it’s still dark and moist thanks to the plastic. How long does the plastic stay on there? 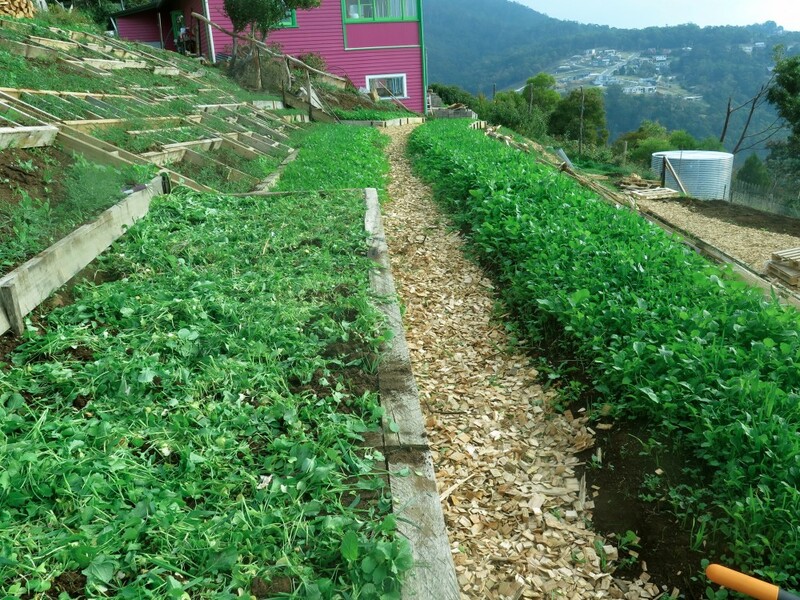 This varies depending on the season, weather and crop rotation system you have in place. We left ours on the garlic for around one month, checking it every now and then to see if it had germinated. Once you can see fairly even germination it’s time for the plastic to come off. The garlic you can see above and below is pale green/white, this is fine as it’ll green up in 2-3 weeks. The main thing we like is the lack of competing plants that garlic has to deal with (garlic hates competitors) and the fact we didn’t have to do the usual manual weeding to get it to this point. As we’re having a unusually dry winter we’re now watering the garlic a bit to kick it along – otherwise our work here is done. We’ll water as needed (c’mon winter rains!) 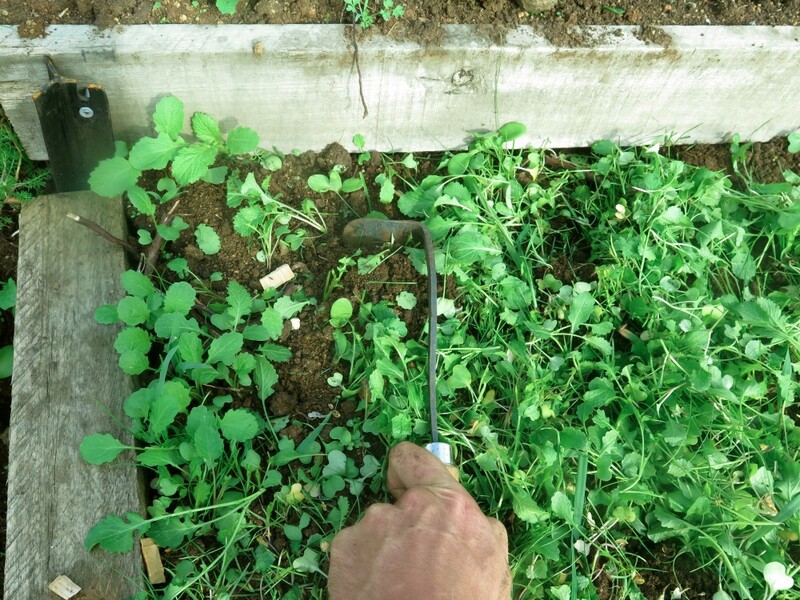 and do some light manual weeding here and there – but the next key job we’ll have to do here is harvesting later on in the year. Yesss!